An undated photo Cesar Sayoc released by Broward County Sheriff's office. A SUSPECT HAS been charged with five federal crimes in connection with more than a dozen suspicious packages sent in a US mail bombing spree, Attorney General Jeff Sessions said this evening. The charges include inter-state transportation of an explosive, mailing of explosives, threats against former presidents and threatening inter-state communications, Sessions told a news conference. If put on trial and convicted, the suspect faces up to 48 years in prison. The Justice Department originally said 58 years, but later corrected this. FBI chief Christopher Wray confirmed the suspect is 56-year-old Florida resident Cesar Sayoc. Investigators have been searching coast to coast for the culprit behind the bizarre mail bomb plot aimed at critics of the president and an arrest has now been made. “We can confirm one person is in custody. We will hold a press conference at the Department of Justice at 2:30pm ET,” a DoJ spokesperson said on Twitter this afternoon. 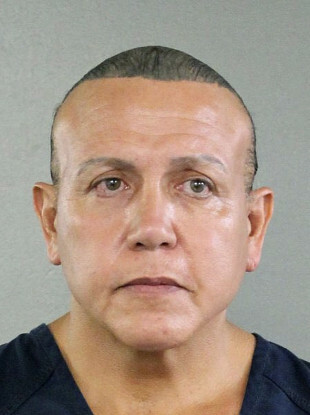 He has now been identified by law enforcement officials as Cesar Sayoc, 56, of Aventura, Florida. He was arrested at an auto parts store in the nearby city of Plantation. Court records show Sayoc has a history of arrests with the Wall Street Journal reporting that he was arrested in Miami in 2002 for a bomb threat. WSJ also reports that Sayoc is a registered Republican and voted in the presidential primary in 2016 and the general election. Officers were seen on television examining a white van, its windows covered with an assortment of stickers, in the city of Plantation in Florida. They covered the vehicle with a blue tarp. The arrest comes after another suspect package was discovered today, addressed to Democratic Senator for New Jersey Cory Booker. Three more devices were linked to the plot yesterday— two addressed to former Vice President Joe Biden and one to actor Robert De Niro — bringing the total to 11 in an outbreak of politically loaded menace with little if any precedent. Authorities warned there might well be more. No motive has been ventured for the mailing of the crude devices, which comes just two weeks before Election Day. But they were uncertain whether the devices were poorly designed or never intended to cause physical harm. A search of a postal database suggested at least some may have been mailed from Florida, one official said. Investigators are homing in on a postal facility in Opa-locka, Florida, where they believe some of the packages originated, another official said. The officials spoke on condition of anonymity because they were not authorised to discuss the ongoing investigation by name. The targets have included former President Barack Obama, Hillary Clinton, CNN and Representative Maxine Waters of California. The common thread among them was obvious: critical words for Donald Trump and frequent, harsher criticism in return. At a press conference yesterday, officials in New York would not discuss possible motives or details on how the packages found their way into the US postal system. Nor would they say why none of the packages had detonated, but they stressed they were still treating them as “live devices”. Details suggested a pattern — that the items were packaged in manila envelopes, addressed to prominent Trump critics and carried U.S. postage stamps. The devices were being examined by technicians at the FBI’s forensic lab in Quantico, Virginia. The packages stoked nationwide tensions and fears as voters prepared to vote 6 November to determine partisan control of Congress — a campaign both major political parties have described in near-apocalyptic terms. Even with the sender still unknown, politicians from both parties used the threats to decry a toxic political climate and lay blame. “A very big part of the Anger we see today in our society is caused by the purposely false and inaccurate reporting of the Mainstream Media that I refer to as Fake News,” Trump said on Twitter. It has gotten so bad and hateful that it is beyond description. Mainstream Media must clean up its act, FAST! CNN didn’t immediately respond to messages seeking comment before business hours today. The list of bombing targets spread from New York, Delaware and Washington, DC, to Florida and California. The explosive devices were packed in envelopes with bubble-wrap interiors bearing six American flag stamps and the return address of Florida Representative Debbie Wasserman Schultz, the former chairwoman of the Democratic National Committee. The bombs seized on Wednesday were about 15 centimetres long and packed with powder and broken glass, according to a law enforcement official who viewed X-ray images. The official said the devices were made from PVC pipe and covered with black tape. At the New York briefing, authorities confirmed that at least some of the packages were distributed through the US mail, and cautioned that there could be additional devices in the postal system. The tape on the pipe is “an investigator’s dream,” he said, recalling a case in Texas that was solved because the fibres on the tape were traced to the bomber’s dog. He said bombers tend to plot methodically. The new packages discovered on Thursday set off a new wave of alarm. Like earlier targets, both Biden and De Niro have been sharply critical of Trump. The actor dropped an expletive insult at Trump at this year’s Tony Awards and apologised to Canadians for the “idiotic behavior of my president”. Biden said last week that the president may not “know what he’s doing” and coddles dictators. Trump has called Biden “Crazy Joe” and “mentally weak”. The packages were “clearly an effort to terrorise people politically, to choose people for political purposes and attack them because of their beliefs,” New York Mayor Bill de Blasio said. The first crude bomb to be discovered was delivered on Monday to the suburban New York compound of George Soros, a liberal billionaire and major contributor to Democratic causes. Soros has called Trump’s presidency “dangerous”. Similar packages addressed to Clinton and Obama were intercepted on their way to Clinton’s New York home, where she lives with former President Bill Clinton, and to Washington, where Obama lives with his wife, Michelle Obama. The Secret Service said neither package reached its intended recipient. Other packages were sent to frequent Trump critics Waters and former Obama Attorney General Eric Holder. His ended up at the Sunrise, Florida, office of Wasserman Schultz, who was listed as the return address. Email “US mail bomb suspect charged with five crimes - faces 48 years in prison if found guilty”. Feedback on “US mail bomb suspect charged with five crimes - faces 48 years in prison if found guilty”.